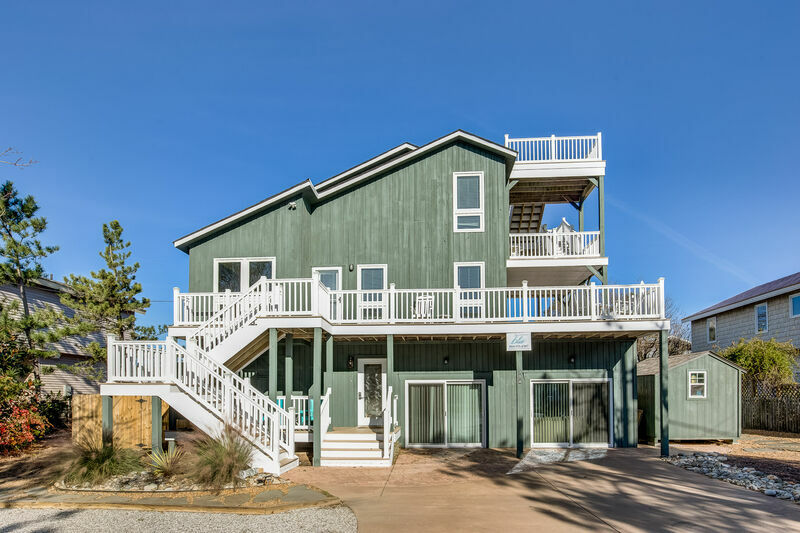 Find your own “Oasis by the Sea” at this cozy, Sandbridge vacation rental nestled in the quiet north end of Sandbridge Beach. Love the water? You will enjoy this home for the 4 minute walk to the ocean OR the fabulous 50 ft +L-shaped private pool offered (heat optional seasonally) ! Just a few houses away from the beach access, spend the days building sandcastles, surfing or just relaxing on the pristine and uncrowded beach at Sandbridge Beach’s famous north end. There is plenty to do at the house: Air hockey and ping pong all in the garage/converted kid’s play room. Enjoy the ocean views from the rooftop deck. You can relish meals available “al fresco” on the mid-level deck teak table. Take a day to explore the local attractions…kayak along Back Bay to absorb the natural beauty of the area, take a walk on the wild side at the Virginia Beach Boardwalk for a ride in a Pedicab Rickshaw, take in the street side entertainment or just peruse the local shops and eateries. Shopping is near at Red Mill Commons or just a few minutes further for mall shopping. Family activities are always available at Ocean Breeze Family Water Park with putt-putt, go carts, a wave pool, and many, many waterslides to thrill young and old alike. The Virginia Beach Aquarium offers otters, fish, sharks, and many other attractions and interactive learning for the kids. You make the call: Take a week of relaxing on the beach and bonding at this lovely home, have an exciting week of activities offered in the area, or mix it up…it all adds up to finding your “Oasis by the Sea”. Top-Level: King Master with LCD TV and Deck Access leading to rooftop deck. Mid-Level: Great Room with LCD TV, Hardwood Flooring, Kitchen with Bar seats 3, Dining Table seats 8, Hall Bathroom with shower/tub combo, King Bedroom; Bedroom with 2 Bunk Beds; Deck with Teak Table, seats 8. Ground-Level: King Bedroom with TV; Bedroom with 2 Futons doubles as den with LCD TV; Hall Bathroom, Laundry with HE Washer and Dryer, Garage/Playroom with Ping Pong, Air Hockey. Extras: Private Pool (56 x 15 ft.approx.) Heat Optional Seasonally, Wireless Internet Access, Ping Pong Table, Air Hockey, Gas Grill, Horseshoe Pit, No Smoking, PETS NOT ALLOWED, Parking: 6 Cars, Distance to the Beach: 740 ft. Private pools are open from May 3, 2019 until October 6, 2019. Pool heat is an available option in this property, for a fee of $300 plus tax. All Sandbridge Blue properties provide bed linens, bath towels, beds made prior to your arrival, and a starter supply of: toilet paper, bathroom soap, paper towels, and dishwater detergent. Mini Stay pricing is base rate + daily rate. Base rate for this property is $200.00. See below for the daily rates.